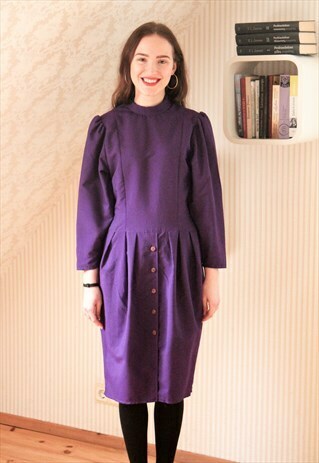 Lovely bright purple long sleeve high neck vintage dress with buttons at the bottom. The size on the label is 36. Model is a UK 6 and 5"4. Length of the dress is 39 inches, chest 18 inches, waist is 15.4 inches, has a zip at the back. Please note this is a vintage item so minor signs of wear are expected.